The development of trust in a relationship is highly depen­dent upon two core concepts: empathy and attunement. Attunement is about being deeply aware of yourself and others. It is also about being receptive to information you get from others. When two people are attuned to each other, there is emotional aware­ness, responsiveness, and empathy. An empathetic person is sensitive to your feelings and can “walk in your shoes.” He is respectful of your viewpoint. Even if it differs from his, he can validate your feelings or attitudes as reasonable and understandable. He will demonstrate toler­ance for your perspective without defensiveness, harsh judg­ment, or criticism. Whether you are dating or in an ongoing relationship, a man who is attuned to how his behavior affects you, who can show empathy and validate your experience, is a keeper! This is the type of person who would not treat you poorly, because he is aware of how it feels to be treated this way. He would respond thoughtfully and appropriately if he realized he had hurt you. This does not mean you will never be hurt or misunderstood. It does mean that your partner can lean into the relationship, apologize if necessary, and show concern for having hurt you. This occasional “rupture and repair” interaction is com­mon in all relationships. I emphasize the word occasional — as in “not the usual.” The norm is not to be constantly hurt and frustrated, but hurt and frustration do happen sometimes. The difference lies in how your partner handles it. Trust is earned. You do not have to, nor should you, trust someone implicitly when you first meet. This does not mean you are suspicious of that person’s intentions. What it does mean is that you do what we do in the American justice sys­tem: assume that someone is innocent until proven guilty. Your mind remains open, receptive to the signs that someone is trustworthy or not. You pay close attention to words and ac­tions to see if the “trust meter” rises or falls. If it falls, you should not keep trying to cement a relationship with this per­son (even if you believe you are in love with him). Healthy and successful relationships have several core char­acteristics in common. These relationships are defined by the couple’s sense of safety and security, empathy for each other, responsiveness to the other’s needs, and attitude of we-ness. Each partner is attuned to the other, and they both openly communicate. There is a profound understanding and aware­ness of each other. They count on each other and believe firmly that each has the other’s back. They also take emotional risks with each other — they are not afraid to be vulnerable. They have the courage to show each other who they really are. Trust and safety is built slowly and gradually from the beginning of a relationship. In fact, this trust and safety is the founda­tion a relationship is built on. When it isn’t there at the start, the relationship is built on a faulty foundation and often never fully recovers. If this is hard to imagine, look around for role models en­gaged in healthy and secure relationships. Think about those in your life currently or in the past. How do these couples treat each other? How do they interact with each other, the world, and those around them? What seems to make their bond solid? You can also reflect upon the way that healthy and se­cure people interact with you. How do they avoid drama and toxic behavior? How do they handle conflict and challenges in life? How do they respond to you when you are having trou­ble? It is likely you do know several such people and couples who can help you see that healthy relationships are possible! In a healthy relationship, there is open, assertive, and ef­fective communication. There are no games. Communication is clear and direct. When healthy couples get stuck or start arguing, they tend to address what is underneath the surface. When attachment-based triggers are activated in such situ­ations, an emotionally unavailable partner will typically use deactivating strategies — distancing thoughts and actions — that cause him to turn away when you need him the most. An emotionally available partner will express his fears, longings, and vulnerabilities to you instead of shutting you out. In turn, it will feel safe for you to do the same. When partners tap into their vulnerabilities and share them, they can come together to work through the problem. They can both use coping skills to effectively reduce their reactivity and overwhelming emo­tions so that they can stay present and engaged with each other and talk calmly. When partners communicate in a healthy way, they are able to get back on stable ground relatively quickly after an argument. Their equilibrium returns, and they carry on without holding grudges. Some of the characteristics of healthy relationships embody what is known as emotional intelli­gence. Emotional intelligence is about being adept in several core areas involving emotion within yourself and in your in­teractions with others. The areas of personal competence in­clude self-awareness and management of both your emotions and your behaviors in response to them. Accurately perceiv­ing your own emotions and positively channeling those emo­tions are key to becoming personally and socially competent. The other component of emotional intelligence is how ac­curately you tune in to the emotions of those around you and assess what might be going on with them, and whether you use this knowledge efficaciously to mediate your interactions with them. As you can imagine, emotional intelligence is some­thing you want to develop and something you want to look for in a partner. Emotionally intelligent people experience much more successful platonic and romantic relationships, greater academic achievement, more positive interactions with their children, and greater success at work. A lot seems to ride on our having emotional intelligence! It is impossible for every person to possess everything on this list, so don’t be discouraged. Take an inventory of what you believe you are good at and what may need some more devel­opment. Feedback from others can also be beneficial, since we sometimes don’t see our shortcomings clearly. When you are interacting with another person, the two of you will experience varying degrees of something termed interper­sonal regulation of emotion. This type of emotional regula­tion emerges when you are trying to influence another person in order to reach a goal. This often includes influencing this person’s feelings or thoughts. For example, when you sense distance between yourself and your partner, and you seek re­assurance of his ongoing interest in you, you are engaging in an interpersonal regulation tactic. If you are interacting with someone emotionally unavailable and/or you have an anxious attachment style, you will tend to emphasize closeness, inti­macy, connection. Your efforts will collide with those of some­one who values autonomy and distance. It is essential for you and your partner to find a way to balance conflicting needs so that you are both satisfied with the relationship. Both prefer­ences are valid, but when there are extreme differences in two people’s goals — the goal of emphasizing closeness, intimacy, and connection on the one hand, and autonomy and distance on the other — conflict and dissatisfaction will result. Partners with a secure and healthy relationship do not view these goals as incompatible. They remain flexible and find ways to balance and coordinate them. Copyright ©2019 by Marni Feuerman. All Rights Reserved. 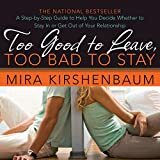 Psychotherapist Dr. Marni Feuerman offers profound and insightful advice for all those who find themselves in painful and unsatisfying relationships again and again. She offers explanations and solutions for why we attract and accept poor treatment, experience a lack of emotional connection from romantic partners, and often reject the good ones. Based on the science of love, neurobiology, and attachment, as well as Dr. Feuerman’s clinical experience, this book will help you recognize why you get stuck and how to change these patterns for good.